Ingredients such as propylene glycol alginate (PGA) may be added to beer to stabilise the foam head and to aid resistance to breakdown of foam in the presence of detergent residues or grease on the glass. The alginate is added gradually into the vortex and dispersed into the water. Mixing continues for up to an hour (depending on batch size) to ensure thorough dispersion. The solution is then left to stand for several hours to allow hydration to be completed. 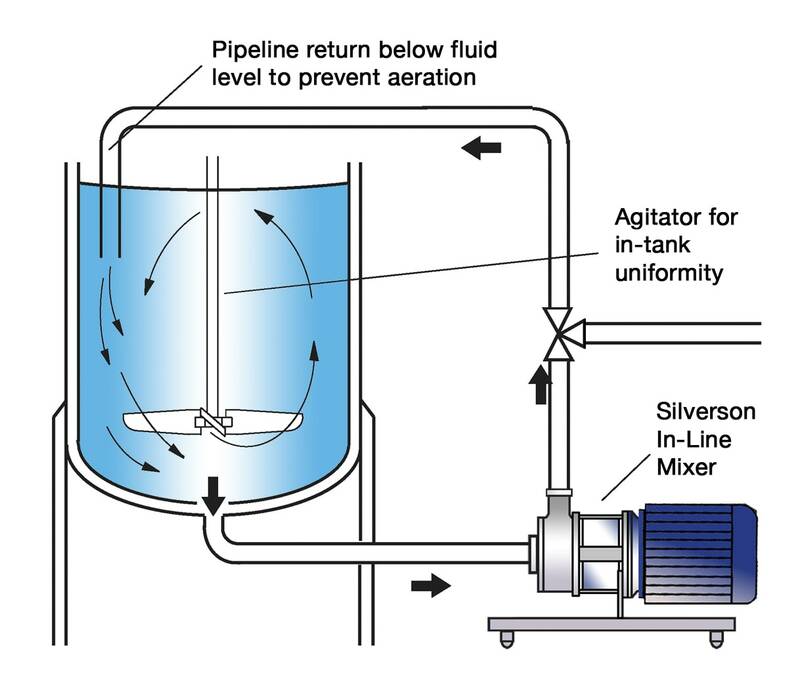 The mixer is run for a further period to ensure the solution is homogeneous. Pasteurisation may be carried out to destroy any microorganisms. PGA tends to agglomerate. Partially hydrated material on the outside of the agglomerate prevents dry particles inside from being exposed to the surrounding liquid and dissolved. Conventional agitators do not produce sufficient shear to break these down. 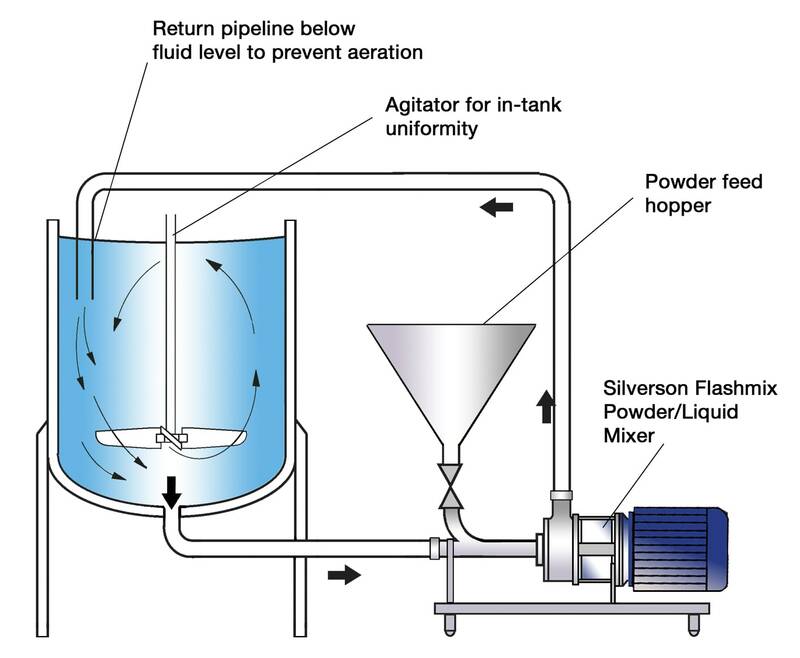 Long mixing times are required to obtain the required dispersion/solution. Powder has to be added under controlled (labour intensive) conditions to prevent lump formation and scumline on the vessel. Once viscosity increase or gelling has started to occur, agitation of the solution and therefore dispersion of powder becomes increasingly difficult. Aeration must be avoided to prevent foaming, as owing to the nature of the product, the foam is difficult to disperse. The vessel is charged with the required amount of water. The Silverson mixer is started and the alginate is added all at once as rapidly as possible. 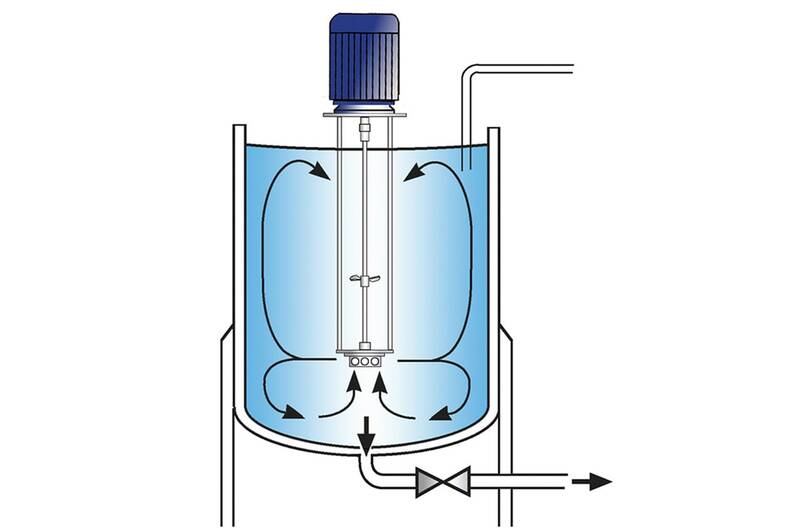 The high speed rotation of the rotors creates a powerful suction which draws the water and alginate particles into the workhead. The materials are subjected to intense shear within the workhead. Any agglomerated particles are fully broken down in the clearance between the ends of the rotor blades and the stator wall. The product is then forced out through the stator and returned to the mix. Fresh liquid and powdered ingredients are simultaneously drawn into the workhead, maintaining the mixing cycle. In a short time the product passes through the workhead many times, ensuring that thorough dispersion is rapidly completed. Rapid powder addition rate eliminates operator error. Stable viscosity of end product. Thickening/gelling effect of the alginate is maximised. Reduced aeration and oxygenation due to shorter mixing times.